​"I really look forward to my Thursday evening Yoga class. From the minute I walk through the door I begin to relax and unwind in the positive atmosphere Alison creates in her classes." ​"Alison manages to provide an excellent balance each week between new work and time to practise what has been covered in previous classes. This keeps the lessons fresh and challenging while building confidence. I am impressed at how Alison manages to adapt moves to individual needs within the class." ​"Just to say, I really enjoy your Yoga classes which keep my busy life in perspective & enable me to focus on the important aspects in a calm & relaxed manner. I look forward to learning new Yoga positions & teachings in the future including the “dog dolphin”!" 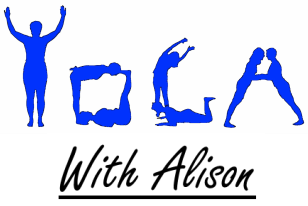 ​"What yoga means to me: a chance to exercise, relax and re-focus on me, it's my favourite time of the week. I really look forward to my Thursday evening Yoga class." ​"Thank you Alison, I feel safe and relaxed in your class, taking up yoga has been good for my mental and physical health." ​"I find Alison a very calm, careful & encouraging teacher. I feel more peaceful, and walk taller, after a class."